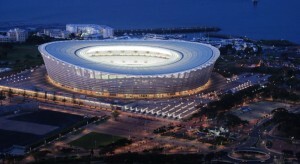 Cape Town Stadium, one of the Mother City’s iconic treasures, has been shortlisted for the Event of the Year Award during the United Kingdom-based Stadium Business Summit. The award recognises the event host venue and I think it is fantastic that we are being considered for this prestigious international accolade. The awards are the only awards for the industry and presented each year during The Stadium Business Summit. Having entered for hosting the HSBC Cape Town Sevens, the Cape Town Stadium was named finalist for Event of the Year. The local facility is up against other events which are hosted in stadiums in Russia, Spain, England, United States and Australia. The 2019 ceremony will take place at Emirates Old Trafford on 4 June 2019 in Manchester in the United Kingdom. The award recognises the event’s host venue and the venue’s management or operational team for delivering an excellent event. The HSBC Cape Town Sevens has over the last two years been named as the Best Live Sports Experience in South Africa at the Discovery Sport Industry Awards. This recognition is testament to the great collaboration between the Cape Town Stadium management, the event organisers and all of those involved in putting this showpiece together. Having developed a strong track record as the World’s Leading Festival and Event destination, the shortlisting is testament to Cape Town’s ability to host high quality events and the expertise in stadium management. This was underscored by how the Cape Town Stadium hosted two back-to-back sold-out Ed Sheeran concerts last week. As the City, we are proud of the Cape Town Stadium management as well as the event organiser for putting together an event that is being recognised by international audiences. HSBC Cape Town Sevens is one of our signature events and we are confident that this year’s upcoming event will be another highlight which hopefully will attract more accolades. We wish the Cape Town Stadium management well ahead of the award ceremony.